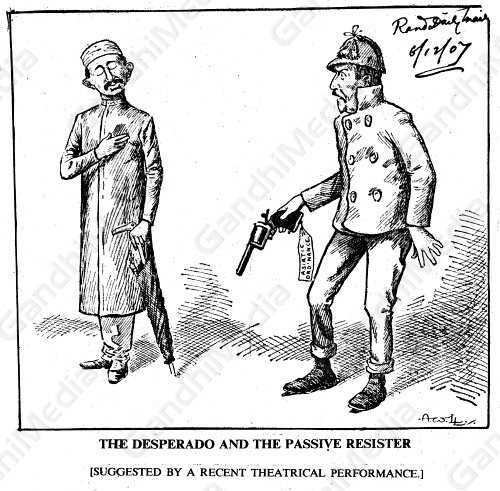 The Desperado And The Passive Resister - [Suggested by a recent theatrical performance] - Rand Daily Times, South Africa, 6 Dec 1907. The year 1907 saw the Indian settlers and the Transvaal Government confronting one another, the Government threatening to use force to counter the new weapon of satyagraha Gandhi had devised to protest against the discriminatory legislation against Asians. The rulers of the Transvaal had made it clear that they had one set of laws for whites and another for "inferior" races. The seeds of apartheid were sown at this time.